You got a thumbprint-reading iPhone 5S or a pastel rainbow iPhone 5C! Maybe you want to view your Blu-ray movies on your new iPhone, what now? Here’s what you need to do for your new iPhone 5S or 5C, whether you are a first-time user or an iOS pro. The guide below walks you through the process of making your iPhone 5S/5C play Blu-ray titles. To enjoy Blu-ray movies on your new iPhone 5S or 5C, you need to use a third party Blu-ray to iPhone 5S/5C Converter to rip Blu-ray to a format that is well compatible with your Apple device. Pavtube Blu-ray Ripper is highly recommended to do this job. 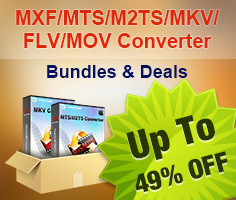 It features optimized format preset for Apple iPhone, and takes simple steps to finish Blu-ray to iPhone video ripping. You load a Blu-ray disc into the program, choose a format as target for iPhone 5S/5C, and click “Convert” to start, Pavtube software will take care of the rest. Click “Load file(s)” icon to browse your Blu-ray drive and load Blu-ray movie files from your disc. 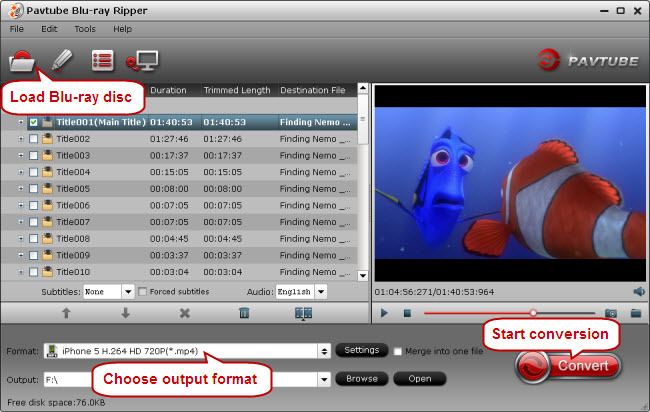 This Blu-ray ripping software automatically detects the main title in a Blu-ray, so you needn’t looking around for the main title among numerous movie titles. Click on the Format bar, navigate to “iPhone” column and select “iPhone 5 H.264 HD 720P (*.mp4)” as output format for your device. The recommended 720P MP4 format will keep a good balance between output file size and image quality. If you prefer to customize file quality by yourself, you can click “Settings” button and go to “Profile settings” panel to do so. 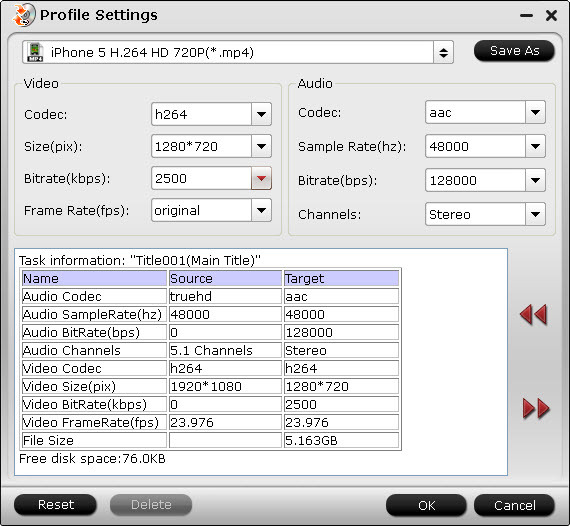 Video and audio parameters such as codec, size, bit rate, frame rate, sample rate and audio channels are all adjustable here. When the above mentioned steps finished, click the big button “Convert” to start Blu-ray to iPhone 5S/5C ripping. The generated 720p MP4 video can be found through clicking “Open output folder” icon on the “Conversion” window. Now you are ready to sync the ripped Blu-ray MP4 video to your iPhone via iTunes.